Fraser Beattie joined Business News in May 2014 and covers all of the latest mergers and acquisitions, contracts and deals, state politics and resources news online. Fraser graduated from Edith Cowan University in 2012 with a bachelor of communications degree, and majored in Journalism and broadcasting. He had a stint at a local radio station in Park City, Utah, in 2013, where he covered the latest trends in music in the US. Fraser left Business News in 2017. Fortescue Metals Group, Iluka Resources and Rio Tinto are among the five overall category winners in the 2017 state government’s Awards for Excellence. Ausdrill's long-serving chairman, Terry O’Connor, has announced he is handing over the reins to his deputy Ian Cochrane later this year, putting to rest a 24-year career with the mining services business. Gold miner Doray Minerals is considering a joint venture arrangement with Metals X spin-out Westgold Resources over its Gnaweeda project. Perth-based Altech Chemicals has received firm commitments for a $17 million capital raising to fund ongoing development of its high-purity alumina plant in Malaysia. A joint venture comprising local engineering group Clough and Finnish corporation Wartsila has won a contract to build a power station in Papua New Guinea for an undisclosed sum. Henderson-based shipbuilder Civmec has announced plans to list on the ASX, with details of its entry yet to be determined. CTI Logistics has acquired national business Jayde Transport in an all-cash deal worth up to $7.5 million, as it seeks to lessen its reliance on the local market. The administrators of troubled oil and gas services provider Go Marine Group say they are confident they can recapitalise the business. Sheffield Resources has tapped investors for $32 million to fund ongoing development of its Thunderbird mineral sands project in WA. Industrial business Schaffer Corporation has sold its Urbanstone manufacturing subsidiary to Brickworks for $13.5 million. Local company Dreamscape Networks has entered into an agreement to acquire Sydney-based Enetica Group for $4.4 million in cash. SpacetoCo is a web-based application that allows users to search, book and pay for the space the user needs wherever he or she is located. It allows anyone who has space to list it for availability for free. Western Australia’s unemployment rate fell 0.2 percentage points last month, putting it among the top performing states for annual employment growth, according to new data. Sheffield Resources has announced plans to spin-out its gold and base metals assets into a separate entity and list it on the ASX, as it progresses development of its flagship Thunderbird mineral sands project. Aspiring gold miner Gascoyne Resources has tapped NRW Holdings for a $300 million mining services contract at its Dalgaranga project in Western Australia, while NRW's managing director has received a boost to his salary. Sheffield Resources has mandated finance group Taurus to arrange a $US200 million ($A255 million) debt facility for development of its Thunderbird mineral sands project, and also named GR Engineering Services as its preferred contractor. Newcrest Mining will spend $93 million this quarter to expand its Telfer gold mine in Western Australia, after the state government was last week forced to abandon its planned gold royalty increase. Troubled Indian sandalwood producer Quintis has ended its sales agreement with a Chinese customer that was being investigated for customs evasion. A joint venture between Perth-based engineering group Clough and French company Suez has won a contract to build the second stage of a water recycling plant in Craigie, which is the major component of the state government’s $262 million groundwater replenishment scheme. Perth-based explorer Elixir Petroleum has entered into an agreement to acquire a Mongolia-focused coal seam gas business in an all-scrip deal worth about $4 million. The volume of freight through Fremantle Ports has remained static for the third year running, raising further questions about when the proposed outer harbour development at Cockburn Sound will be needed. An joint venture between engineering group Clough and Dutch company BAM International has won a contract to provide its services to a $100 million marine project in the Northern Territory. Nearly 650,000 people visited Perth’s iconic tourist destination Rottnest Island in the 2017 financial year, with about a third coming from either interstate or overseas. Internationally renowned whisky reviewer Jim Murray has labelled Limeburners’ Darkest Winter whisky the best drop in the Southern Hemisphere. Swan Valley-based Feral Brewing Company has been sold to the business that bottles and distributes Coca-Cola in the Asia-Pacific region for an undisclosed sum. Having grown Perth-based Navitas from a start-up 23 years ago into a global education services provider and one of WA's top 10 listed companies, co-founder Rod Jones is handing the reins to former iiNet boss David Buckingham. Decmil Group has won more work on a highway extension project in Victoria, with the new package worth about $60 million. The Real Estate Institute of Western Australia has revealed 10 Perth suburbs where properties are selling faster now than during the mining boom, with four of the top 10 in the western suburbs. Perth house prices have fallen 7.4 per cent over the past 18 months, making it the worst-performing housing market in the country. The state government has received a proposal for a $1.85 billion World Trade Centre in the Perth CBD from a Middle Eastern-backed private group that includes former Perth Airport manager Neil Kidd. An infrastructure delivery company that had carried out work on the NBN rollout in Perth has collapsed. 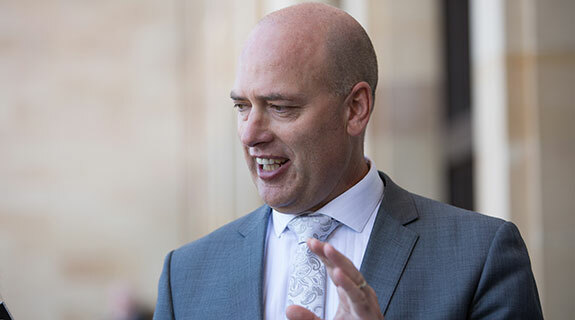 The state government has named a consortium led by Leighton Contractors as the preferred proponent for construction of the $500 million Roe 8 highway project, which is the first leg of the contentious Perth Freight Link. Opponents of the state government’s controversial Roe 8 highway extension project have taken their fight to the High Court following a recent decision that validated the project’s environmental approval. The state government has locked down a site for a new public secondary school in Perth’s western suburbs that will open its doors in 2020. Indian sandalwood producer TFS Corporation has blasted US-based short-seller Glaucus Research Group for a scathing report which accused the Perth company of operating a Ponzi-like business structure.